Robert Harris - Dueck Defense, Inc. I can’t tell you how excited I was to install your sights on my scoped LMT MRP rifle. 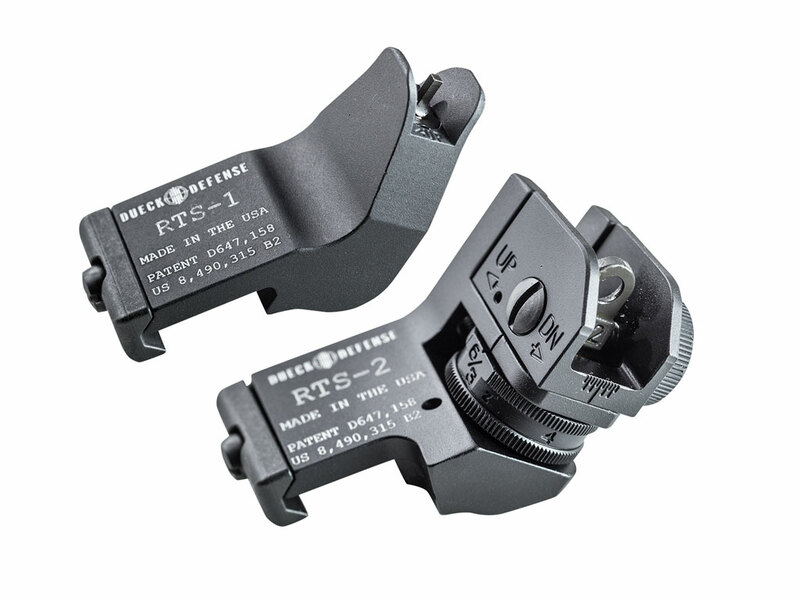 It was like Christmas all over again and my wife was laughing while I was staring at the rifle.The ‘RTS’ sights are very high quality and will come in useful for any AR/Rail Type rifle that utilizes magnification along the M1913 Rail. The sights are perfect for far and near targets and can be used as a primary or secondary option, depending on the distance and situation. I also like the flat head screw for mounting as you can use a dime or multi-tool screwdriver in the field to tighten them. The container for the threadlocker was a hit as well. I can’t tell you how many times manufacturer’s supply threadlocker that comes in a small bag pouch and ends up everywhere but the actual threads. Excellent attention to detail and convenience here! The packaging was nice as well. I can’t wait to get these in front of L.E. Departments, 3-Gunners and Military alike. If you can let someone in the U.S. Army Products Procurement Group see these, I am sure they would be highly interested. Thanks again! I can't tell you how excited I was to install your sights on my scoped LMT MRP rifle. It was like Christmas all over again and my wife was laughing while I was staring at the rifle.The 'RTS' sights are very high quality and will come in useful for any AR/Rail Type rifle that utilizes magnification along the M1913 Rail. The sights are perfect for far and near targets and can be used as a primary or secondary option, depending on the distance and situation. I also like the flat head screw for mounting as you can use a dime or multi-tool screwdriver in the field to tighten them. The container for the threadlocker was a hit as well. I can't tell you how many times manufacturer's supply threadlocker that comes in a small bag pouch and ends up everywhere but the actual threads. Excellent attention to detail and convenience here! The packaging was nice as well. I can't wait to get these in front of L.E. Departments, 3-Gunners and Military alike. If you can let someone in the U.S. Army Products Procurement Group see these, I am sure they would be highly interested. Thanks again!